There is a very easy way to change youtube video quality without using a plugin, extension or other third party software but by changing youtube default settings (either for all your youtube videos or for the video you are currently watching). By default youtube will automatically select the video quality they believe is best for your viewing by taking into account: your internet connection speed, the size of the video player and the available format they have for each video. Nevertheless you can change it by using youtube settings or video player options. By default the first option is selected which lets youtube decide which is the best video quality based on internet connection speed and video player size. If you want to always see videos in High Definition then check “Always play HD on fullscreen (when available)”. If you want the opposite i.e. to always view the videos in lower quality (suitable if you don’t have a good internet connection) then select: “I have a slow connection. Never play higher-quality video”. 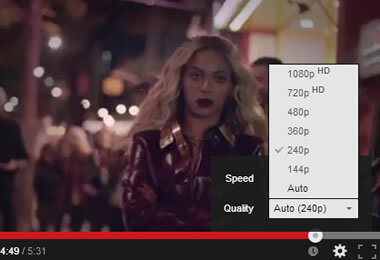 Another way to change the youtube video quality is through the video player settings. While viewing a video go to settings (gear icon on the video player taskbar) and then from the quality drop down menu, select one of the available options. Note that High definition video quality has the letters HD next to the resolution. Open the youtube app and click the 3 vertical dots in the top right corner and select settings. Then select General and check the first option which says “High quality on Mobile”. Please note this option is only available on Android Phones and not Android Tablets. Alternatively, while watching a video click the 3 vertical dots again and select HD to view the video in High Definition. If you are using the youtube iOS app then while watching a video in the player click the 3 vertical dots and then select Quality from the options. You will then see all available formats for the particular video and you can select the quality you want. That’s it, by default youtube will select the best quality for your videos but you can change the settings to better suit your needs.